This 18th century Château estate is now a public park with formal gardens, fountains, and a small lake with pleasant cafe. 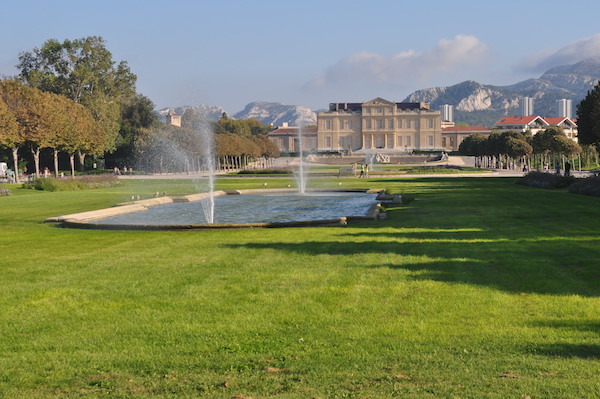 Designated as one of the Notable Gardens of France. Enjoy running on the paths of three gardens: the Garden à la Française, composed of a two lawns, a circular basin and a rectangular basin, and double rows of trees, between the avenue du Prado and the gates of the park: an English landscape garden, on the west side of the park, surrounding a lake, and decorated with statues and a fountain; and a recently renovated race track, connecting to the sea by a promenade. The park also features a Decorative Arts Museum. A tour of the park is 1.5 km. Also, on the north side of the park, a 1 km pedestrian path, the Sentier de l’Huevaune, follows a small river to Avenue de Mazargues. Note: the park is open 6am to 9pm. Longer Run: Take the pedestrian path, the Traverse Olympique, to Prado Beach, and run north along the Kennedy Corniche to Marseille.